Western Screech-owls are a small, common owl in the United States. For many people, owls are a favorite bird. One of the most common owls in the United States is the small Screech-owl. There are currently three species of Screech-owl found in the United States – Eastern, Western, and Whiskered. At one time the Western and Eastern Screech-owls were considered the same species as they are extremely similar. Scientists now consider them two different species. The Western is classified as Megascops kennecottii and the Eastern as Megascops asio. The Eastern and Western screech-owls have very little overlap in their range, and their primary vocalizations are different. The Eastern call is a series of short whistled hoots that descend in pitch, typically described as a “whinny” similar to a horse. They also have a single-pitch elongated trill. The Western species has a series of short whistled hoots, but these increase in tempo similar to a bouncing ping-pong ball. Their trill is a double trill. In addition to these calls, both species hiss, bark, and make other sounds. In this blog I will only address the Western Screech-owl, describing 6 facts about their lifestyle. 1) Western Screech-owls range from South-eastern Alaska down along the west coast of Canada, throughout the western half of the United States, and into Mexico and parts of Central America. They live in a variety of habitats including forests, deserts, riparian areas, scrublands, mountains, coastal areas, and even large gardens and parks in populated areas. 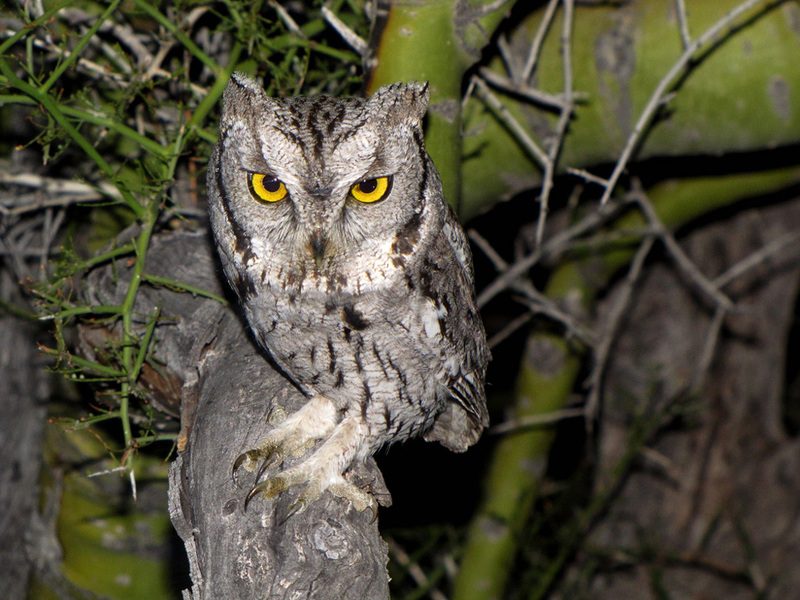 Western Screech-owls will take up residence in tree or cacti cavities as well as urban nesting boxes. 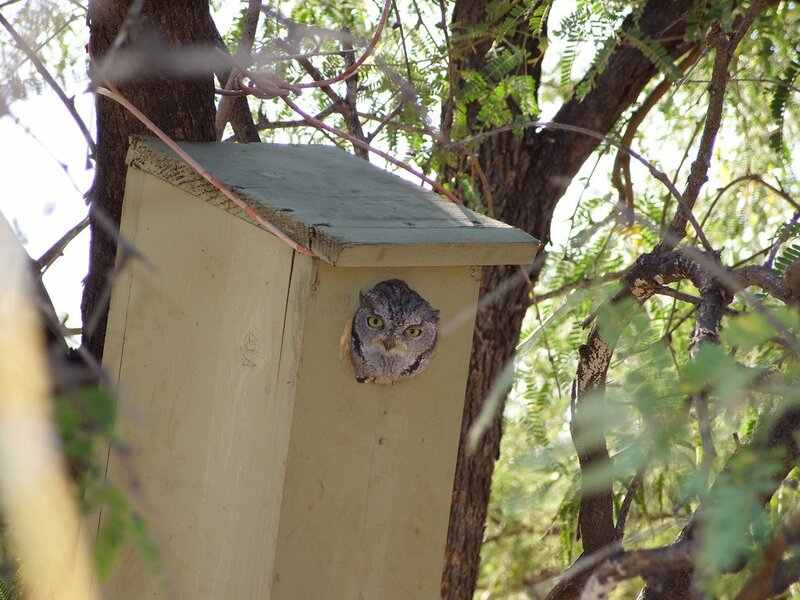 Western Screech-owl in Nesting Box. 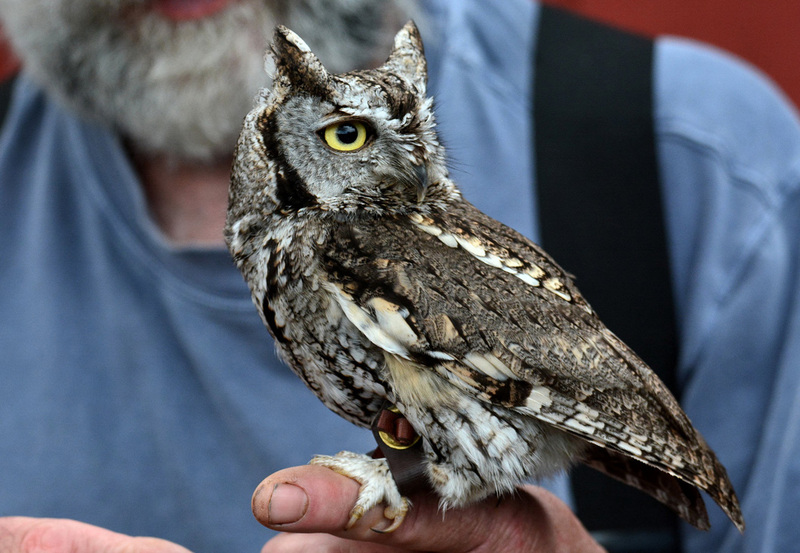 2) Western Screech-owls are more likely to be heard than seen. Nocturnal hunters, they usually spend their days in, or looking out of, a roost hole. While hunting, they typically perch on tree branches, looking and waiting for prey to appear. They will, however, catch flying insects in midair as well as hunt bats that come their way. They may even walk along the ground looking for something tasty to dine on. 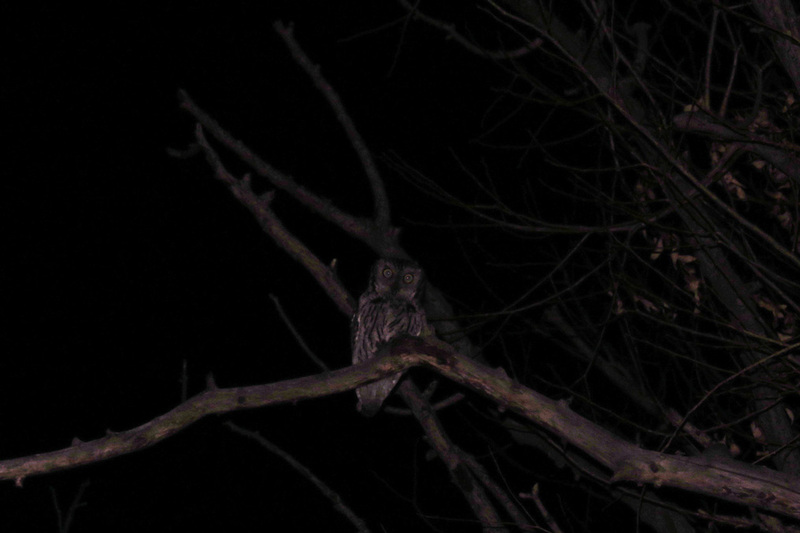 Western Screech-owl hunting in a sit-and-wait position. 3) Diets of Western Screech-owls vary greatly. Though they mainly feed on small mammals such as gophers, rats, bats, and mice, they will also prey on small birds, insect, worms, slugs, snails, reptiles, and amphibians. They have been observed perching above creeks, watching for crayfish to drop down on. Western Screech-owls have even been known to dine on whip scorpions. These small owls, ranging from eight to nine inches in height, will at times take prey much larger than themselves – such as cottontail rabbits and mallard ducks! 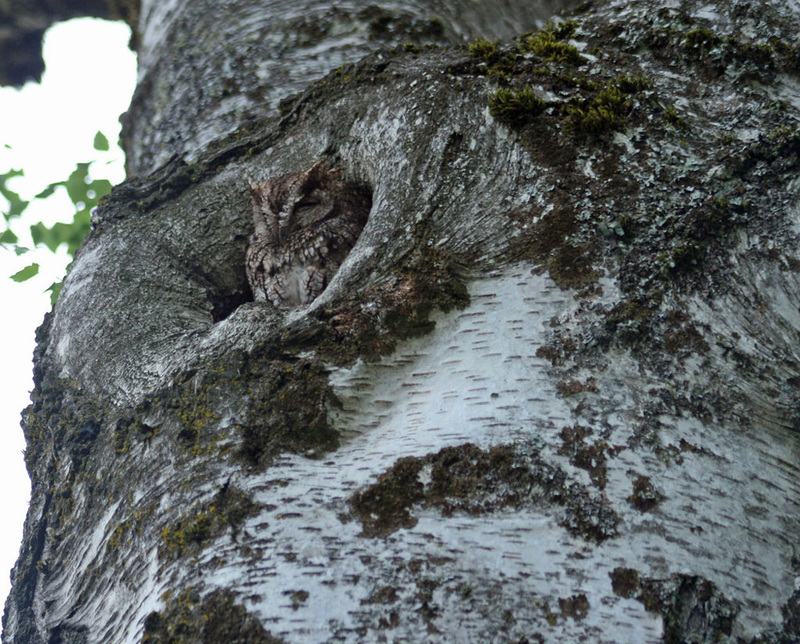 Western Screech-owl in a roost hole of an Aspen Tree. 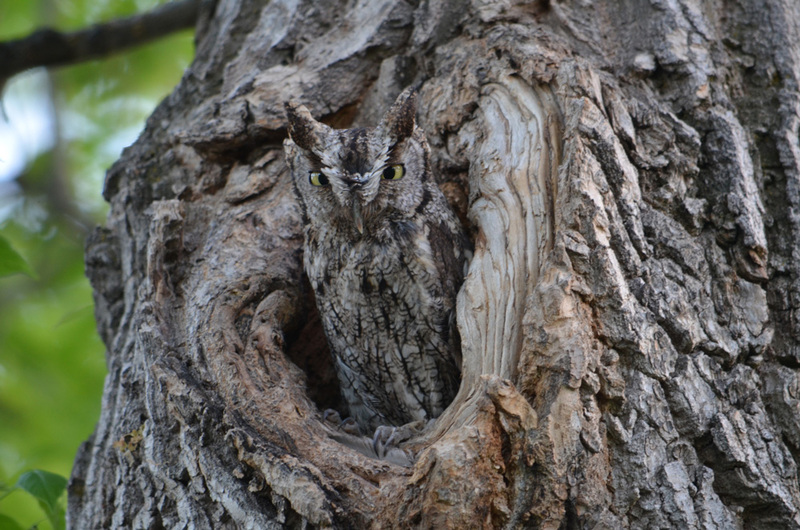 4) Western Screech-owls have excellent camouflage, allowing them to blend in easily with the bark of many types of trees. When sensing danger, an owl will often straighten its body, tighten its feathers, partially close its eyes, and remain absolutely still, often causing it to resemble a tree branch. This effort helps the owl to look invisible to predators. 5) Like other owls, the Western Screech-owl does not build a nest. Sometimes they take over a nest built by another species. Generally, however, a nesting cavity is preferred. These cavities are often old woodpecker excavations, or may be created where a branch fell off a tree. The owl will not add any material to the cavity but will simply lay its eggs on whatever material happens to already be present in the hole. When available, a nesting cavity will be chosen with the entrance just large enough to admit the owl’s body. This helps to make the cavity a little less easy for predators to get into. 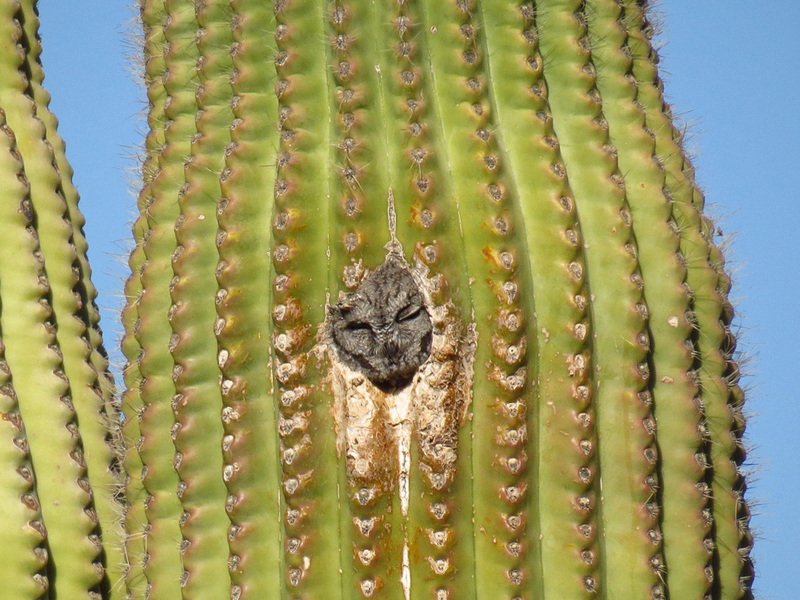 A Western Screech-owl looking out of a small entrance to a cavity in a saguaro cactus. 6) It is the male of the species that locates a usable cavity. He will then call or lead the female to the hole, sometimes encouraging her by carrying a delicious looking prey item to the chosen location. During the courtship, the pair will often sing duets and the male will present food to the female. 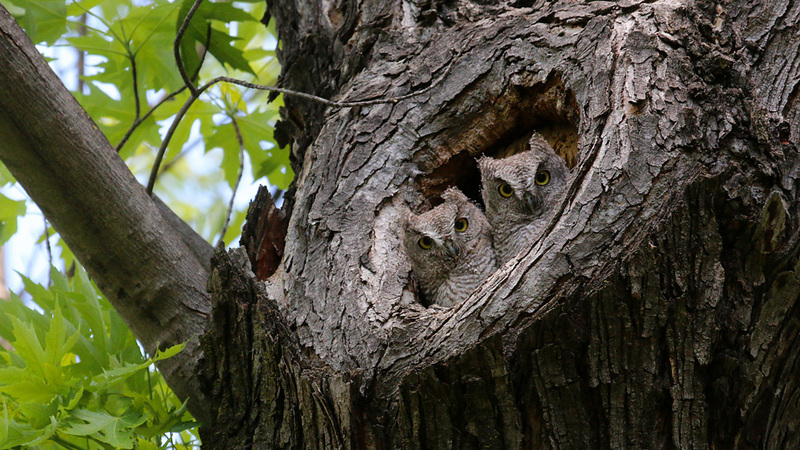 Western Screech-owls are termed “socially monogamous,” which means that the pairs take part in raising the young together. Both sexes, however, may have affairs, mating outside of the pair. Despite this, the pair seems to show affection, often perching close together and preening each other. During the breeding season, the male will roost near the nest cavity. When he is not roosting, it is his job to hunt, supplying all the food for the female, while she remains in the nest to incubate the eggs and care for the young chicks. Both the female and the male will take part in guarding the entrance of the nest cavity from crows, ravens, jays, and other predators. After about 3 weeks, the female will take breaks to help with the hunting. When the owlets no longer need the constant attention of the female, she will leave the nest to roost close by, often perching so close to the male, that their bodies touch. After the young fledge (leave the nest), they are still not completely independent, and will remain with their parents for about 5 weeks. Two Owlets looking out from their nesting cavity. Despite not always being strictly faithful to their mate, pairs do mate for life, sometimes returning to the same nesting hole. However if they lose their mate, they won’t morn for a minute, and will readily accept a new partner. So. . . if you heard that bouncing ball call in the Spring, listen for it again the following year, and you may again find that you have a pair of Western Screech-owls living in your area.